Today's recipe is a simple snack as that is how I like to make it. Simple, Easy, and pH alkaline balanced. That way anyone who reads my blog says, "I can make that"
I am sure I have missed out on some super delicious recipes. Time is a deciding factor for many of us, and after a long day we want to make something quick, delicious and healthy. Do you know how many times I have eaten nachos, loaded up with cheese, and loaded up with nacho sauce? Way to many times to want to admit. I decided a couple of weeks ago to try Nachos without cheese and without sauce. Oh my goodness, what a wonderful adventure it was for me. Most health stores now carry a Plain Nacho chip, low in fat and low in sodium. Before you purchase your chips take some time to read the labels and get the lowest sodium available. These chips are to be eaten in moderation, and not as a full meal. Remember this is a snack. Yes, I now, it will taste so delicious you will want to eat the entire tray!! Always keep in mind the 75% Alkaline, 25% Acidic Rule so load them up with veggies! 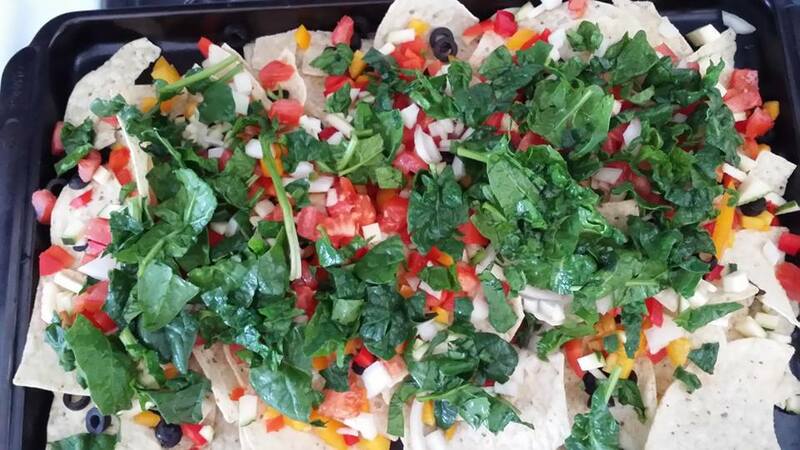 Preheat your oven to 350 degrees F. Spread out your Nacho chips on a non stick pan. Cut up all your awesome veggies and sprinkle all over to make it an even coating. If you want to spice it up you can add Jalapeno peppers. This month I want to share with you an Organic Bar that is just simply 100% Delicious and 100% Fabulous. It's called Taste of Nature. It comes in many flavours however my favourite is the Brazilian Nut Fiesta. Taste of Nature is 100% certified organic, Non-GMO project certified and Gluten Free. They are made with the very best ingredients the world has to offer. And yes, they taste as good as they look! Raisins*, peanuts*, agave nectar*, sunflower seeds*, almonds*, Brazil nuts*, brown rice syrup*, walnuts*, whole grain brown rice crisps*, pumpkin seeds*, sunflower oil blend* (sunflower oil*, mixed tocopherols, rosemary extract*), agar. The glycemic index (GI) is a property of the carbohydrates in different foods, specifically the blood glucose raising ability of the digestible carbohydrates. A GI score of 55 or less is considered low and desirable for hypoglycemic and diabetics. In experimental tests, this product scores 39.4. 100% Organic, Certified Kosher, Certified Vegan, Gluten Free, Low Sodium, Source of fibre, Source of Energy, Non GMO. * Certified organic. May contain sesame, tree nuts and soy. Here is the website where you can find out more about these tasty healthy bars and find out a store closest to you to purchase them. Full credit to this blog goes to Taste of Nature. Remember to always Be Fabulous!!! Thank you to everyone who has taken time to comment on You Tube for my card/poem There Comes A Time. It has been nominated and is in the top 3 currently for A Women's Hope Magazine. The judging is based on You Tube comments. When I wrote this poem in no way did I think it would be known world wide. It has gone now to over 37 countries. The comments and emails I get regarding my poem on how it has changed lives is the most humbling thing that I have ever experienced. To hear that people keep this card by their bedside and read it daily so warms my heart. If you have not seen the video or read the card you can view it at the link below. If you feel moved to comment please do so. I hope it makes a difference for you. Eating a pH balanced diet with lots of alkaline foods truly does energize your body, however along with an alkaline diet you need the proper amount of sleep as well. Both go hand in hand. Have you ever felt groggy upon waking, or do you lack the energy needed to get through your day? Studies show that the connection between lack of sleep and health problems are becoming greater each year. People are not getting enough "good" sleep. Lack of sleep not only makes you feel tired and sluggish, but it can be the root cause of other conditions such as weight gain, high blood pressure, low immune system, and anxiety/depression. Getting a "good" night sleep in imperative to Good Health. I personally do my best to make sure I get my 8 hours a night. When I don't get my 8 hours this is when I feel sluggish, lazy or when a cold or flu can set in. If ever I feel like I am getting sick, I take a nice bath and hit the bed early. There is nothing better than a "good" night's sleep to fight of what is ailing you. So how much sleep is enough? 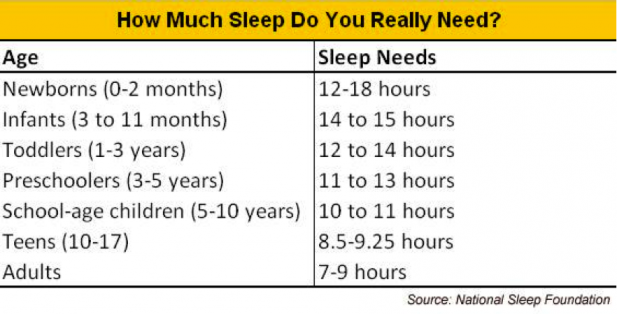 I found this chart below from the National Sleep Foundation. Remember to relax before bedtime, and keep yourself away from anything that cause you stress. Stay away from watching television before bedtime and internet activities as they both create active brain waves and harder to relax. I know most of us are not getting the healthy amount of sleep on the chart however there is no time like the present to begin.